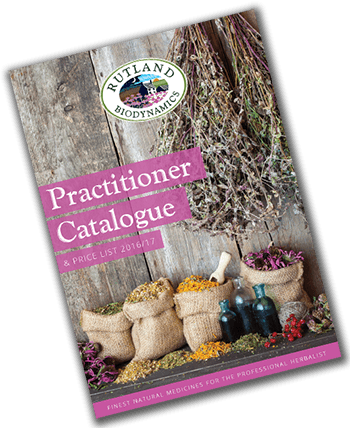 Rutland Biodynamics: for practitioners seeking the highest quality ingredients for their patients. (a) ingredients for practitioners to make up into finished prescriptions for their patients, or for other authorised manufacture. (c) products that are branded and licensed for retail sale, either for our own-brand, other own label or contract packing. This website is for practitioners seeking the highest quality ingredients for their patients. If you are looking for finished herbal medicines made by Rutland Biodynamics, licensed either to re-sell through shops or dispensaries, or for personal consumption, then please click here to link to our specialist retail brand, English Herbal Medicines.